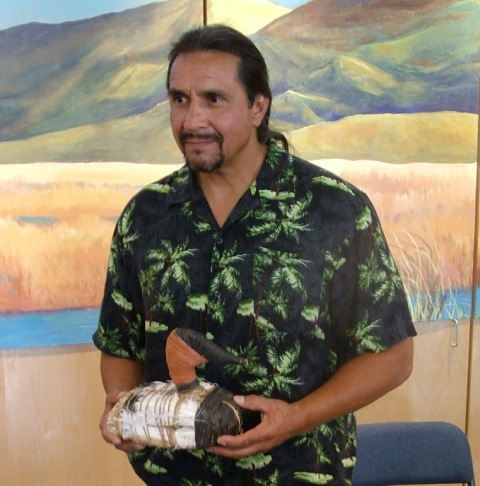 Born and raised in Carson City, Nevada, Mike Williams is a member of the Fallon Paiute-Shoshone Tribe. He is dedicated to creating accurate replicas of the canvasback duck decoys, egg gathering baskets, clothing, and boats woven by his ancestors in ancient times, as a way of honoring and perpetuating their culture, heritage, and traditions. After seeing photographs and ancient decoys, Mike was inspired to create precise replicas of this Great Basin tradition. He studied photographs and examples of the ducks at the Nevada State Museum and taught himself to make and decorate them using the tradition resources and materials used by the forebears of the Numu people. Mike shows audiences how he creates the traditional duck hunting tools of his ancestors, including decoys and egg baskets. As he tells the story of the artifacts discovery, their history and how they were used, his audiences gain an understanding of the powerful role of the tulle plant in the everyday lives of the Numu. Imparting an appreciation for the symbolic significance of the tulle duck decoy in recognizing a culture that has flourished and adapted to changes in the Great Basin for many thousands of years, audiences connect the past to the present. Mike’s contributions to the California Trail Interpretive Center include several tulle duck decoys and a tulle boat on display outside the Indian Video Room.